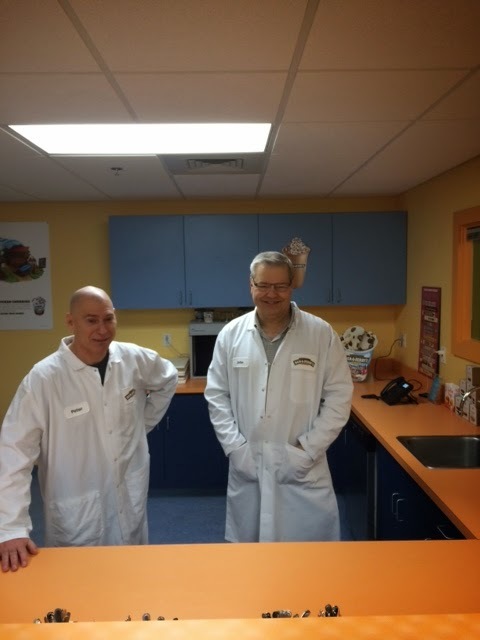 I recently traveled up to Vermont to spend some time with the Ben & Jerry’s team. 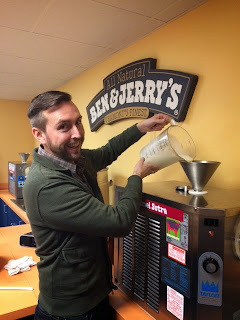 There are many things that I would like to share with Scoopalicious readers about my Ben & Jerry’s trip but a personal high of my ice-cream expedition was being able to compete with and against fellow food bloggers to create a new Ben & Jerry’s flavor. We were broken up in to teams of three and four in order to start our brainstorming. 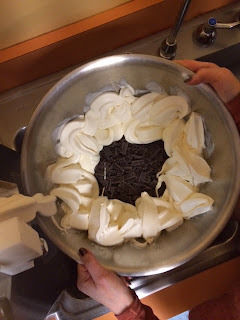 My group consisted of New Yorkers so we decided to create a New York centric ice-cream. Originally we wanted to have a donut flavor ice-cream with dark chocolate covered matzo but we didn’t realize that we would be given a list of options based on their immense inventory (How could they not have chocolate covered matzo?!). Since there wasn’t any matzo, Jon had us try dark chocolate chunks and espresso dark chocolate chunks. The team decided that the espresso chunks might be too intense since the ice cream itself had a coffee flavor, so we decided on dark chocolate. Next up was a chocolate covered almond crunch which we thought would add a unique flavor and texture. Last up was a chocolate fudge swirl to top things off. 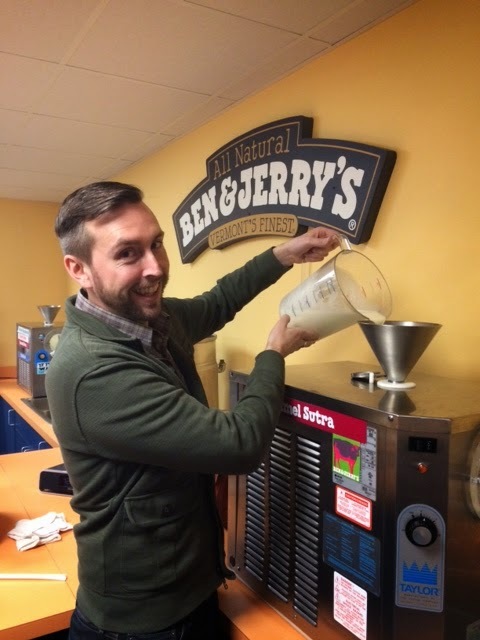 Once the ice cream was finished being made in the machine our team was able to fold the ingredients in to the ice cream and fill pints to be frozen for the competition to be held later that day. Next up we had the opportunity to meet with the marketing department and create a poster with the graphic designers. Kathy from Ben and Jerry’s was incredibly sweet and a good sport considering how intent we were on winning the competition. We spent a lot of time trying to create a New York City backdrop with Woody (Woody is the iconic cow used for a lot of Ben and Jerry’s advertising). We decided on a scene where Woody was holding a coffee cup of ice cream while standing in front of the Brooklyn Bridge. The competition was ready to commence. There was some fierce competitors with such flavors as 40 Weeks that had everything but the kitchen sink to entice pregnancy cravings and The Polar Cortex which played on the idea of our intense winter weather as an ice-cream by adding various crunchy flavors to represent, snow, ice and sleet. Our Flavor Gurus Jon and Peter and one other co-worker had the task of trying all of our flavors to determine who the winner would be. 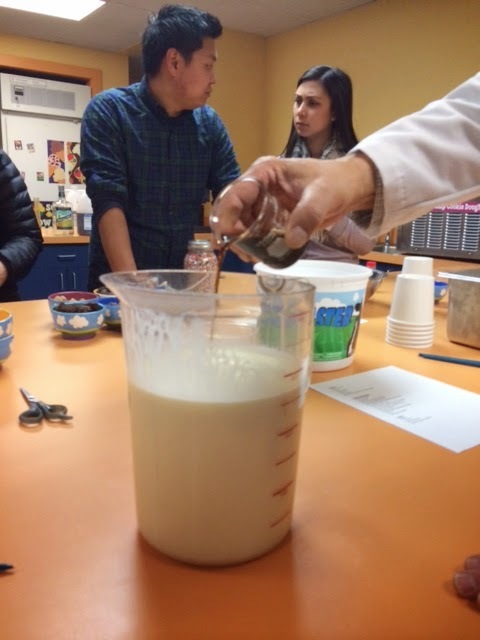 Their deliberation was stressful but we were able to taste all of the other team’s flavors while we waited. The Gurus returned and other teams were eliminated until it was our team and the Polar Cortex team left. 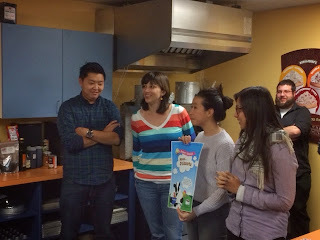 It was announced that both teams were the winners and that each out us would be getting our flavors created by Ben & Jerry’s and served at our Ben & Jerry’s ice cream socials! I will let all of you know when and at which Ben & Jerry’s my ice-cream social will be so you can try our new flavor creation. Scoopalicious is Growing! Welcome, Patrick!